The United Blood Trackers TRACKFEST 2009 took place in western Alabama in the heart of Gulf Coast deer hunting country. Our base was at the hunting lodge and lands of the Wade family situated in a heavily wooded bend of the Tom Bigbee River near Demopolis. The expanses of big timber, the logging roads and the lush green food plots were ideal for the Trackfest emphasis on field work. We alternated between indoor presentations and outdoor sessions in the woods. Indoors we talked about dog training, dog behavior and practical tracking tactics for finding wounded deer. For outdoor work we had seven different breeds of dogs present: Dachshund (wires and a smooth), Lab, Catahoula, Blue Lacy, Southern Black Mouth Cur, Beagle and Bavarian Mountain Blood Hound. At this Trackfest we had 26 participants and seven spouses present, who came from eight different states. There was a strong representation of experienced southern trackers who could compare notes, and share experiences with people who were just starting out. The Northerners, who offered most of the illustrated presentations, learned as much as they taught. In many of the southern states it is legal or acceptable to release dogs when a wounded animal is jumped or to work the tracking dog off-lead from the beginning if conditions permit. This is illegal and politically unthinkable in the North, but in the South it does result in a higher success rate in tracking certain categories of wounded animals. The new Garmin GPS dog locator is now being used by a number of southern trackers. It seems that they eat very well in the South. Gastronomical highlights of the Trackfest weekend were Al Wade’s fish fry one day and Greg Accardo’s famous jambalaya on another. To go with the good food there was much good conversation and much less bragging than you would expect. 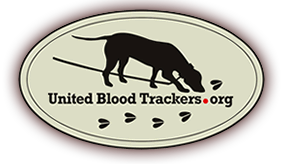 Blood tracking is a game where the performance of the handler dog team can usually be verified. When a handler can show a GPS-produced map of what his dog did on a certain deer call, there is no need for unsupported bragging. The UBT tracking tests this year didn’t lend them selves to much bragging either. We had seven fairly experienced dogs entered in the UBT II test, which is given on a blood line laid the previous day with eight ounces of blood laid over a half mile. Only one dog, a nine-year old beagle named Lilly, passed this test. Lilly is owned and handled by Susan Edwards from Ford City, PA. The other dogs, who had found a number of real wounded deer in the woods, were perhaps distracted by the abundant whitetails present. There was fresh hawg sign in many places, but most of the southern dogs were familiar with this. The successful beagle, on the other hand, was from Pennsylvania where these feral pigs are just beginning to be a problem. On the easier UBT I aptitude test we had better results. The judges saw focused tracking desire and good working styles appropriate to the breed of dog that they were observing. Thanks to the careful planning of the Trackfest Chairman Al Wade and UBT President Andy Bensing, the whole program was very well organized. There was always something to be learned and no time was wasted.